Although digging is one of the most basic of all garden operations, in an average, modern, well stocked garden there is only limited scope to dig. In practice, dig when breaking in a new garden in readiness for long term planting of beds and borders; when preparing to lay a lawn; when taking any new area into cultivation; annually in the vegetable garden. a) Aerates the soil. This enables it to warm up more quickly in spring, and in turn this speeds up plant growth and the breakdown of organic matter. b) Relieves any soil compaction and improves the percolation of rain and irrigation water. c) Makes it easier for roots to penetrate down to lower levels. Deep-rooting plants are more able to withstand drought. d) Creates the ideal opportunity to work in manures. Frequent digging without manuring is bad practice. e) Enables annual weeds to be buried and the roots of difficult perennial kinds to be removed. j) Exposes soil pests on the surface, to be eaten by birds. Heavy clay soils are best dug in autumn or winter. Winter rains, winds, frosts and thaws then ‘weather’ the soil to break down the clods ready for spring planting. 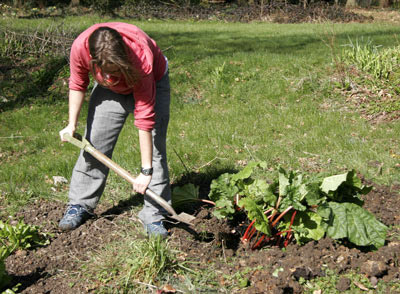 Never dig clay soil when it is wet and sticky; and on really heavy soils it is often better to ‘dig’ with a fork. Light sandy soils don’t have the same need for winter weathering and can be dug at almost any time of year. However, winter weed growth can be a problem on these soils, especially in mild areas. For this reason, spring digging on light soils often ensures a cleaner start. When digging, the aim should always be to allow sufficient time for soils to settle naturally before carrying out final preparations for sowing or planting. Puffy soils make poor seed beds. 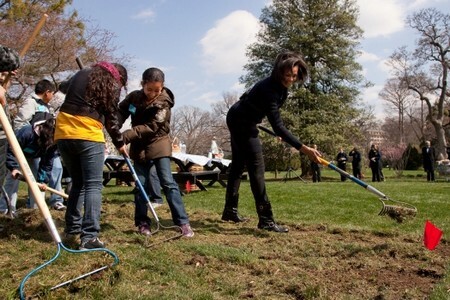 For normal purposes, digging to the depth of a spade will suffice. Subsequently, rely on taking out deep individual planting pockets for setting out deep-rooting trees, shrubs and hedging. Similarly in the vegetable garden, take out trenches for deep rooting crops like runner beans. Starting at one end of the plot, take out a trench the full length of the bed, the width and depth of a spade. On the matter of depth be guided by the depth of good topsoil: don’t bring up the inferior subsoil so as to end up by burying the good topsoil. Having taken out the trench, stack the soil to one side. Spread manure or garden compost into the bottom of the trench. Mark out a second trench alongside the first, again making it the width of a spade. Dig out the soil, invert and throw it forward into the first trench. For efficient working, aim to keep the sides of the trench as near to the vertical as possible and the depth of a spade. Manure the second trench and then mark out a third. Continue in like fashion until the end of the bed is reached. Fill the last trench with the soil from the first. When autumn digging, leave the clods as they fall. The rough surface exposes a greater area to winter weathering. Break down the soil much finer when digging in spring or summer. If the bed is grass side up, the grass should be skimmed off, inverted in the trench in place of manure or compost and then chopped up. Over the turf sprinkle a handful of general fertilizer like Growmore per m (yd) run of trench. This assists in the decomposition of the turf. Treat annual weeds like groundsel and chickweed in the same way as the grass: skim them off into the bottom of the trench. However, be thorough in the removal and disposal of the roots of difficult weeds like buttercup, dock, ground elder, couch grass and dandelion. These must not be buried. Double digging is advisable on all neglected soils, and on compacted soils such as you might find on new building developments. During building operations soil can become over compacted. If this is then simply soiled over with topsoil, without first relieving the compaction, plant roots will find it virtually impossible to make their way down to lower depths. Double digging is carried out in a similar manner to single digging, but trenches are taken out somewhat wider and the manure is forked into the bottom of the trench each time, down to the depth of the fork. Note For those not used to digging, only attempt a little at a time.